How do I change how I run? 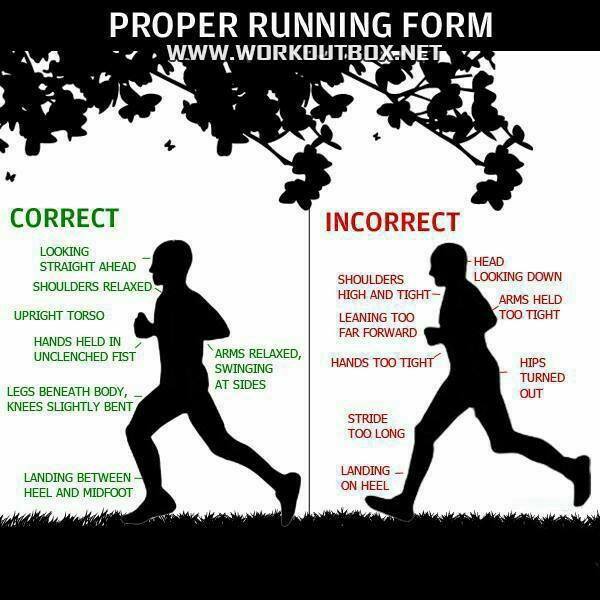 The other day I posted this photo on my personal Facebook page and instantly I received numerous posts about “How do I go from running like the person on the right, to the person on the left.”. It got me thinking that a lot of people recognize that their form may be wrong (ie hurting them) but they just don’t know how to fix it. Now I’m not trying to revolutionize how to run here, but I want to give an explanation that I give to EVERY person who wants to learn how to run more efficiently. This is for the person whose feet, knees, hips, low back, etc hurt while running. This is not a “quick fix” but instead can help people enjoy a lifetime of running. The first step in this problem is admitting that you have a problem. I want you to say, “Hi. I’m (insert your name) and I’m a heel striker.” 😉 Heel striking is the #1 issue that we see with many runners that come in to our shop (TriCycle and Run). Even if it is Laura that is doing the gait analysis (a FREE service at our shop) I can HEAR the heel strikers from the back work area. BOOM BOOM BOOM BOOM. Sound familiar? Whether you are running on a treadmill or the road, if you hear that familiar BOOM, you are putting your body under a LOT of stress. I want you to look at that picture of the man on the right and, instead of a leg out in front, think of a pole vaulter. We’ve all seen that vault where they run forward with that really long pole and stick it in the ground and it bends… A LOT… and then whips back up. Ever seen one snap? They are under an immense amount of pressure. Now go back to the picture. When you strike your heel with your foot WAY out in front of your center of gravity (the chest for the men and the hips for the women), your leg just became that pole. When that heel hits, your lower legs, knees, hips, back take all of the pressure from that strike. And it doesn’t stop there, as you push forward with your rear foot, you now have to come up and over that pivot point to keep your momentum coming forward, so that you can do it all again…and again… and again. There is no “shock absorber” in this locomotion system. Just a foot plant, a pivot over the contact point, and a continuation. Over the past decade there have been many answers to the question of how to fix a heel strike. You may have heard of POSE method, of CHI Running, all of which focus on a “fore-foot” strike. This should not be interpreted as running on your toes, but instead focusing on striking the area of your foot IN FRONT of your arch. This is the forefoot area. In order to get to this area, though, we have to do something counter-intuitive… we have to shorten our stride. Now you may ask why that is counter intuitive but, prior to me saying something, if someone asked you to run FASTER, I can almost guarantee that you took a LONGER stride in the front, to try and gain speed. Remember that pole vault? Well you just make the pole longer, creating more force. Now what we want you to do is SHORTEN the forward stride. Your foot should land slightly (inches) in front of your center of gravity (chest for guys, hips for women) and your propulsion comes from the push off portion of the run. To start this kind of running, you should start in little sections. If you are running on a track, we say “Run the corners”, which means the bends on the track you try this new method, and on the straight away, you run normal. Little by little, you teach your body to run using this new method. But how do I start with a shorter stride? Stand up straight… right now…. nice and tall. Try to stay tight in your core so you are straight line. Now, push your center of gravity (chest of hips) slightly forward but keep your core tight. The lean forward comes from the ANKLES. When your body weight shifts, and you start to fall forward, one foot will go out, but only slightly ahead of your center of gravity. TA-DA!!! THAT should be your running stride when you are focusing on short stride. Now (when you are done reading this) go outside and try this for 15-20 steps at a time to see if you can maintain this. The amount of LEAN forward that you use will help to determine how fast you go, not because you are extending the “pole”, but because you are literally falling forward and your feet are going to try and keep up so you don’t fall on your face. When you want to slow down, or get more control, stand up taller, and you will slow down. Now we consciously focus on running. We want to work on the lean and the striking the front of our foot for small sections at a time. Run the corners of a track, run 15 seconds… then, when you feel comfortable, add some more. Run the corner and a straight (about 200 yards), run 30 seconds. LISTEN (yes, that means take your Ipod off for a few runs 😉 ) to your foot strike. Do you hear BOOM BOOM BOOM, or ___________ ? Be aware of the moment and feel how your body feels and listen to it’s interaction. Over time, this type of running becomes second nature and most people who try it find that, within just a few weeks, that they are running pain and injury free. Our Park Tool School workshop series is back for 2016! Our January workshop will take place Sunday January 3 & Sunday January 17. Hours will be 9:00am – 1:00pm. Registration is available here, and the fee of $150 will be due on the first day of class.